I have had happy holidays so far. I missed the traditional Cookie Day because I was really sick but Christmas Eve and Christmas were both wonderful, filled with family, laughter and love. Christmas Eve was spent at my house out back. We were blessed to have beautiful weather considering it is the end of December. It was a clear night with only a slight breeze and the temperature was just fine. We had a fire in the fire pit and we all sat around it and ate dinner and then opened gifts. 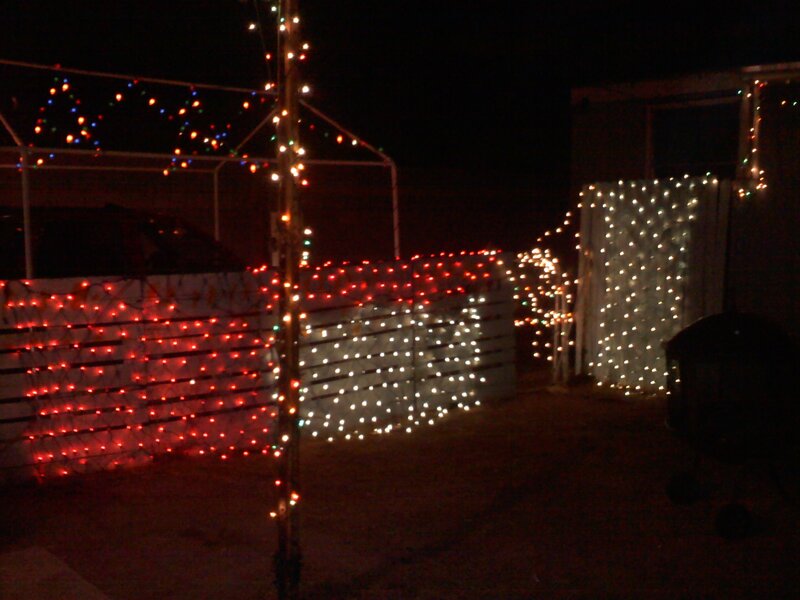 Our backyard was adorned with many Christmas lights so we didn’t even need to use the flood lights to see. This is a sampling of the lights on one side of our yard. There was lots of chatter and laughter. There were about 14 of us so there were different conversations going on at the same time but the joy and happiness spread throughout all of us. It was truly a terrific night just hanging out with family around the fire.